I like to fish, and I like to boat. When I’m boating, I’m not a fisherman. And when I’m fishing, I sure as heck am not a boater. In fact, I’ll wager that the majority of people who fish for recreation just don’t fancy themselves as “boaters”. Let’s just take safety equipment as an example. 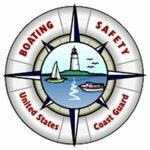 My impression is that the average recreational boater seems to go to considerable trouble to make sure the family “funabout” is replete with all the required safety equipment and gadgets. I personally know a few who actually read the latest issue of the state boating regulations booklet just looking for new rules, hoping to be able to justify the purchase of another piece of nifty equipment for their boat. Then they hurry down to their local marina, marine supply store, or catalog to order the latest version of “whatever it is” the state or federal regulators say they need to help protect themselves and others from becoming statistical entries in the accident logs. All this preparation is done in anticipation of Saturday, the day their heads are cleared of all the workaday pressures, and filled with thoughts of BOATING! On the other hand, it has been my observation that the typical non-commercial fishing person will generally be a bit more “relaxed” about aspects of the nautical experience related to safety equipment. Don’t get me wrong, “gadgets” are a very important part of fishing! Show me a fishing boat without a laser-controlled, satellite driven trolling motor, and I’ll show you a fishing boat owner who is missing a serious advantage in the walleye tournament of life. 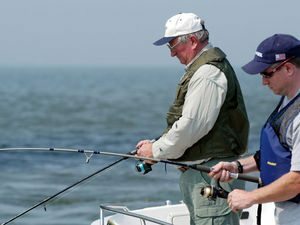 The fishing enthusiast is usually well aware that the same safety equipment rules and regs apply to them as to the family with the ski-boat, and most will make sure that they meet the minimum requirements. But the angler’s primary interest in equipment seems to be in finding space in the boat for their tackle boxes and an ample supply of Buckin’ Bettys and Wiggly Rattlers, and places for all the rods so they don’t get tangled and underfoot. When Saturday comes, their heads are filled with thoughts of FISHING. And even though it’s a “boat” that gets them to where the action will be, and it’s a “boat” that provides a fishing platform when they get there, not many would ever admit to taking part in any boating during their time on the water. The difference in how these two groups of recreational enthusiasts perceive themselves as “boaters” becomes evident in the manner in which each generally views the larger subject of “boating safety”. 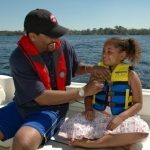 If you don’t see yourself as a boater, then it follows that boating safety doesn’t stack very high in your list of priorities. 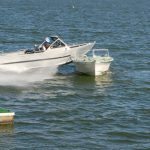 Statistics tell us that most boating fatalities are not from high-powered cigarette boats meeting each other in a thunderous collision, or from boats traveling at speeds which should be only be reserved for Miss Budweiser or the Bluebird. Most fatalities result from the operation of smaller boats, at slow speeds or motionless, on clear weekend days, and because somebody tipped the boat upside down or fell overboard without a lifejacket wrapped around their body. 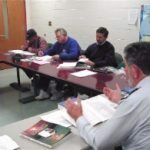 Those of us that teach boating classes can tell you that people who use their boats primarily for recreational fishing are conspicuous by their absence in boating safety classes. It is also interesting to find that the majority of boaters involved in boating accidents have not taken a boating safety course. So today I’m suggesting a couple of things, and asking one favor, of all who fish for fun and use a boat to do it. 2. Wear a life jacket. A personal flotation device is almost a sure-fire way to keep you from drowning when you fall out of the boat. And, they’ll keep you alive longer if you fall into cold water by providing some additional warmth to the core of your body where it’s needed most.